Even sushi skeptics can appreciate the classic California roll, thanks to the cooked crab (no raw fish here) and yummy avocado. 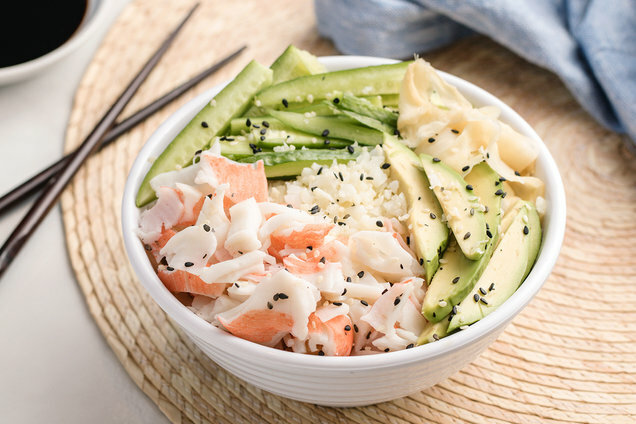 We swapped out carby white rice for cauliflower rice, and served up the whole thing in a bowl… No sushi rolling skills necessary! Click for a video demo! If starting with roughly chopped cauliflower, pulse in a blender until reduced to rice-sized pieces. Place riced cauliflower in a medium microwave-safe bowl. Cover and microwave for 2 minutes, or until hot and soft. Stir in rice vinegar. Let cool for 15 minutes. HG FYI: If you can’t find black sesame seeds, double up on the white sesame seeds. Pass this fun recipe to all your buddies! Click "Send to a Friend" now.